This is a fabulous low-carb, gluten-free substitute for breading that can be used as a coating for things you’re either going to be baking or frying. I use it on both chicken and fish (it’s best for mild white fish, though it’s pretty good on salmon too) and have even added it to meatloaf*. I prefer this tremendously over any other coating I’ve used, as it has so much flavor in comparison to even seasoned breadcrumbs. The first time I used it on fish, my husband said, “this is like…onion ring-fried fish! !” While this breading isn’t overly onion-y (in my opinion, it is perfectly seasoned), I will say that if you like onion rings, you’re going to love it as it does lend a similar flavor and texture experience to your meal. I hope you enjoy! Place dehydrated onion in food processor bowl and process for 1 minute. Add remaining ingredients except the cheese and process 30 seconds. Add Parmesan and pulse to blend. Store refrigerated in an airtight container. 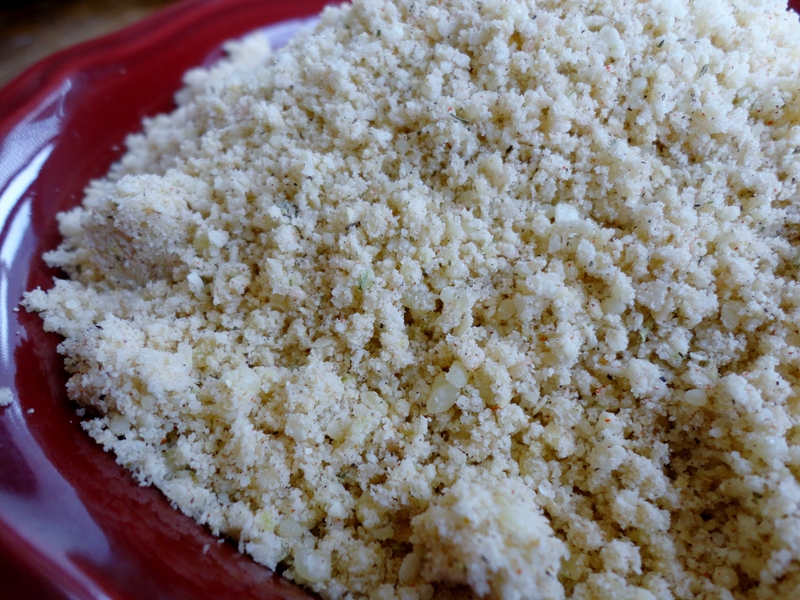 *This doesn’t replace bread crumbs in meatloaf because there is nothing in it to absorb moisture the way real bread can, but it does add great flavor! For a gluten-free meatloaf, you can add in quick-cooking oats along with some of this breadless breading. You will not need to add onions to your meatloaf if you use this breading because it adds plenty of flavor, but I added a red pepper to mine and it was really good! 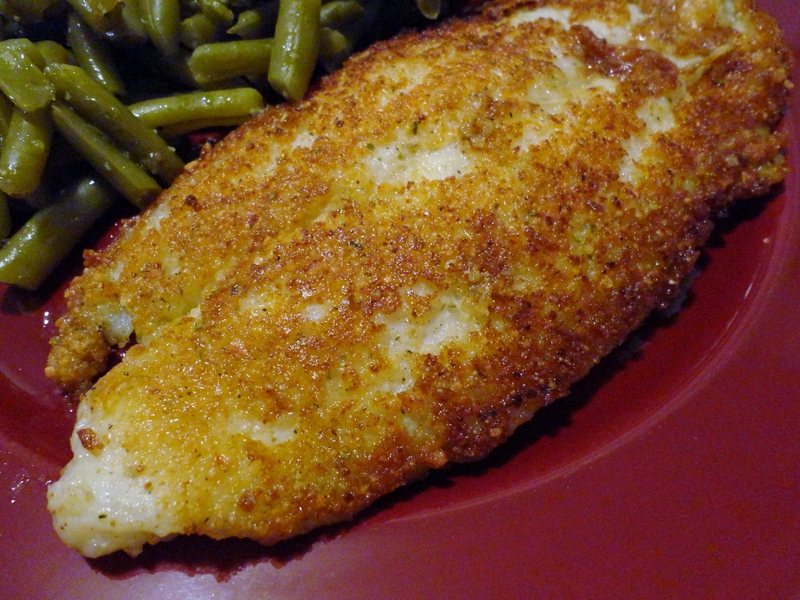 A quick and easy meal: coat one side of fish (this is swai) with breadless breading and fry in olive oil until golden. Flip and cook until the fish flakes easily. Enjoy your Onion Rings-Fried Fish! Posted in Condiments & ETC. and tagged allergy friendly, bake & fry mix, baked, breading, breadless, chicken, coating, fish, fried, gluten-free, low carb, Somersize. Bookmark the permalink. Wow! I don’t have a gluten issue but this sounds WAY better than your average breading. I can’t wait to try it! This really does look much better than breadcrumbs. The onion and the parmesan…yum! I will be trying this for sure! This is what I used on your chicken in basil cream sauce! It added even more flavor to the dish and it was amazing! I think you’ll love it. haha, I know Barbara! I love the bread too, but I prefer this to breadcrumbs for coating. You should try it–I think you’ll be converted! Yum! I love onions, so any added onion flavor is just a plus for me. =) This looks awesome, and I love having recipes and techniques up my sleeve like this one for my gluten free friends (who seem to be multiplying). Mine seem to be as well. I don’t know if it’s becoming more rampant, or if people have always been gluten intolerant but were underdiagnosed and just didn’t know what was ailing them. In any case, I promise you won’t miss the bread when you use this for a meat coating-it’s so good!! Mmm, looks like a yummy meal! Your breading looks super flavorful — love the addition of parm cheese! Ground nuts are one of my favorite additions too. I noticed you’ve used them and I’ve seen them in other blogger’s coatings but I have yet to try it. I bet using nuts instead of the onions would work for people who don’t like onions. I will have to try the nut coating myself, I bet it’s great! That is quite a lot of awesome flavor, what a great idea as a breading replacement. I will remember this for some fish I have in the freezer. Fish is my favorite thing to use this on–it really transforms it! Great idea Veronica! Thank you for sharing. Those flavors sound exactly what I want coating my chicken or fish. Looking forward to trying it! Let me know if you like it as much as we do! Veronica, this sounds fantastic, I never heard of anything like this before, I love learning new ideas like this! Your chicken is perfectly golden and beautiful! I’m sold! I saw this yesterday and kept it in my inbox. That’s a lot of minced onion! Which I of course love so that won’t be a problem. 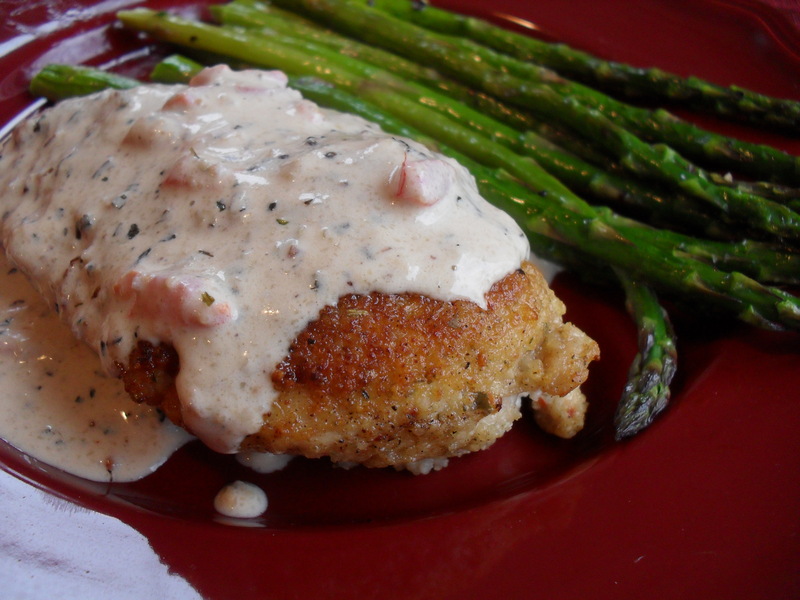 I’m totally making this with chicken, thanks!! Yup, that’s where the “onion rings-fried” comes in. It may be too much onion for someone who dislikes it, but we don’t mind onion and love it. I bet you will too!